Normally I’m rubbish with picking a favourite of anything. I tend to find the unique aspects of a thing, and assign it its own special award for being awesome in its own special way. Of course, this doesn’t always pan out, but as I believe in the power of living positively, I tend to get by. Anyway, I recently went through an exercise to figure out ten of my favourite things in Thailand for an upcoming blog post (yes, hold your hats, I am going to be coming at you with a top ten list! ), and when it came to picking a city, there was no debate at all in my mind, I just loved the Thai city of Songkhla. 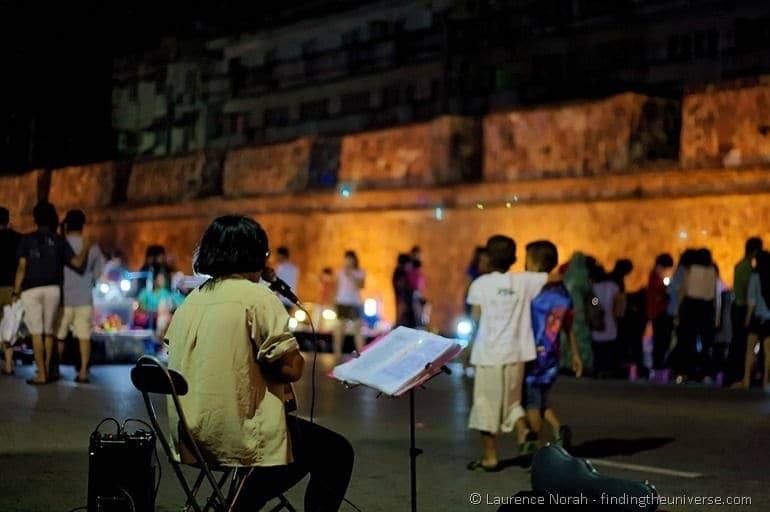 Don’t get me wrong – I loved many other cities in Thailand too. The madness of Bangkok. The laid back vibes of Chiang Mai. 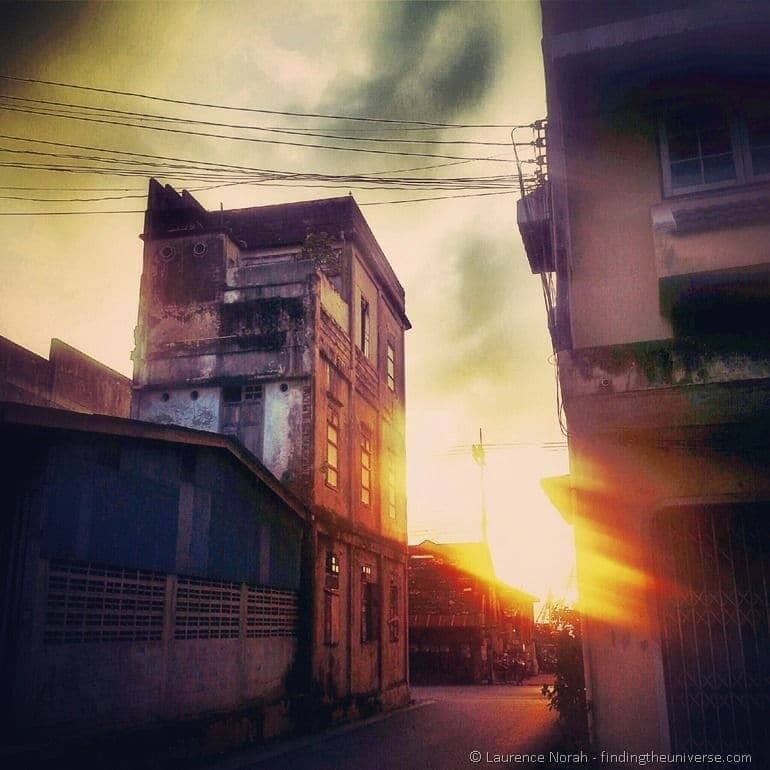 The rustic backstreets of Phuket’s old town. 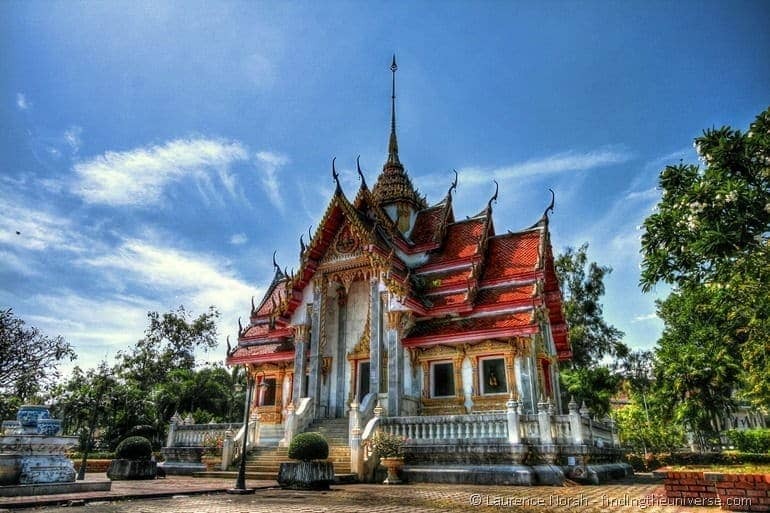 The crumbling jungle ruins and mighty temples of Nakhon Si Thammarat. The… well, you get the idea. They’re all brilliant, in their own special way. For various reasons though, Songkhla really stuck out in our minds. Let’s get on with explaining why. But first, where? Where is this Songkhla place? Don’t worry if you’ve not heard of Songkhla, it’s not exactly on the standard tourist trail. It’s down on the south east coastline of Thailand, around 1000km from Bangkok, and fairly close to the Malaysian border. In fact, up until the 18th century, it was a part of the Malay Kingdom (as well as being a medieval pirate stronghold). 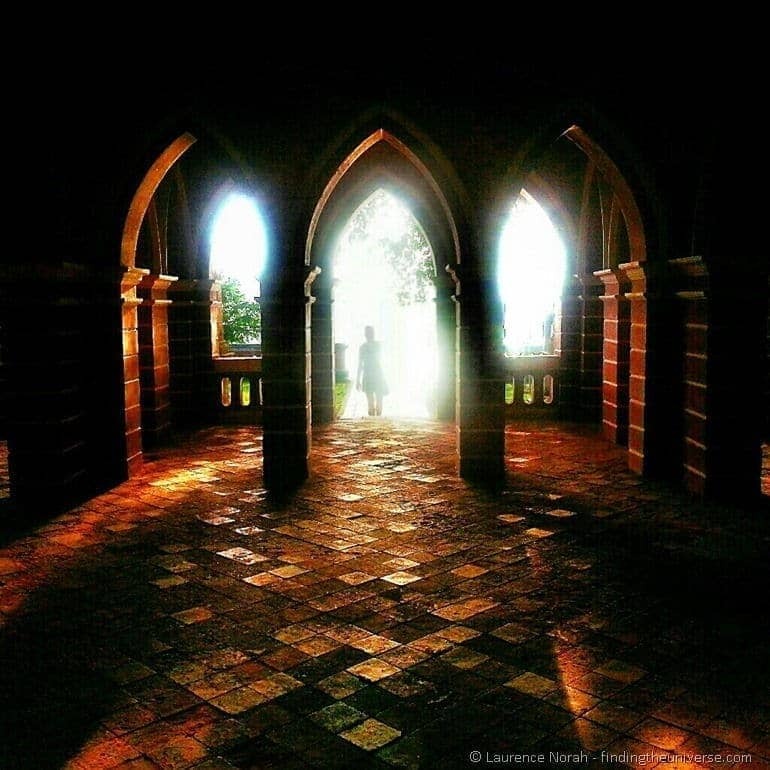 Towering over downtown Songkhla, Khao Tang Kuan is a hill which offers great views over the city peninsula and surrounds. At the top there is a chedi (Dvaravati Chedi), which houses relics of the Buddha, and was built during the reign of the Nakhon Si Thammarat empire. You can make offerings here in a complex looking eight stage procedure, or, as we did, just enjoy the view. The top of the hill can be reached via a 305 step Naga guarded staircase which starts at the west of the hill and ascends past a gorgeous Royal Pavilion to the top. If the walking sounds like too much, there’s also a cable car which goes up from the east side for 30 Baht a go. Around the cable car entrance are hundreds of monkeys, and you can buy food from nearby vendors to feed them. If you want guaranteed monkeys in Thailand, this is the place to come. There’s even a monkey bridge over the road to keep them out of harms way! Ok, so it’s not really 3km long. The Giant Serpent Nag is a sculpture in three parts, with the head being situated 3km from the tail. But it’s not hard to imagine the rest of him being underground. Nag is the deity of water as well as fertility, and was built to bring good fortune to the city of Songkhla. It’s a popular spot for locals, who regularly visit the various parts of the sculpture to pay their respects to the deity. 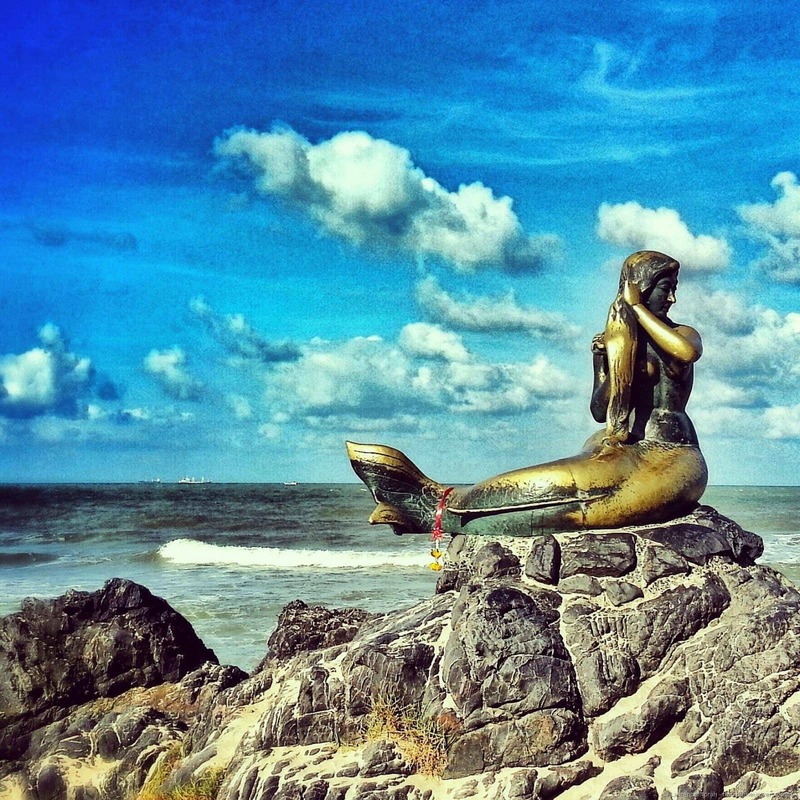 The head, found at the tip of the Songkhla peninsula, jets water out into the bay, and represents the intelligence and wisdom of Songkhla’s inhabitants. 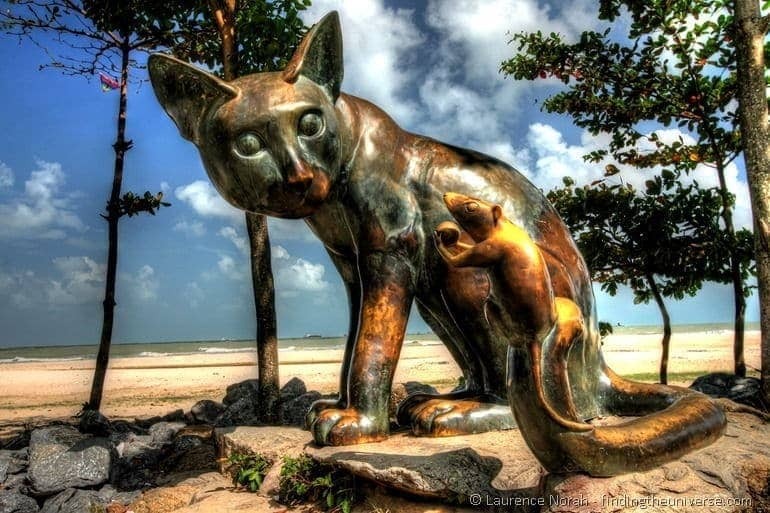 The middle section, the belly of the serpent, is found just north of Monkey Hill, and represents the wealth of the city, whilst the final part, found alongside Samila beach on Chalatad road, symbolises the charisma and strength of the people of Songkhla. More statues, also with a story (of course!). Just offshore from the Songkhla peninsula sit the islands of Ko Nu and Ko Maeo, which translate as cat and mouse island. The legend has it that a dog, a cat and a mouse stole a wealthy merchant’s magic crystal whilst on his boat, and tried to swim ashore with it. The cat and mouse drowned en route, and turned into the islands, whilst the dog made it to shore and died shortly thereafter (these tales never seem to go well). The dog became Khao Tang Kuan, whilst the crystal became the gorgeous white beach of Hat Sai Kaeo. You can visit the cat and mouse, peering intently at one another, down by the beach, and wonder who it is who comes up with these tragic tales of woe. And the mermaid? Well, she’s the symbol of Songkhla, and can be found just along the beach from the cat and mouse, stroking her hair, and thinking what a great deal she got compared to her frozen cousin in Denmark. About three kilometres south of Samila beach is the beach of Khao Kao Seng , one of the smallest and prettiest beaches in the area. Just near here, next to a temple, can be found a giant boulder, known as Hua Nai Raeng. This boulder was where, in times past, locals stored treasures which were used for the construction of the fantastically impressive Nakhon Si Thammarat temple. 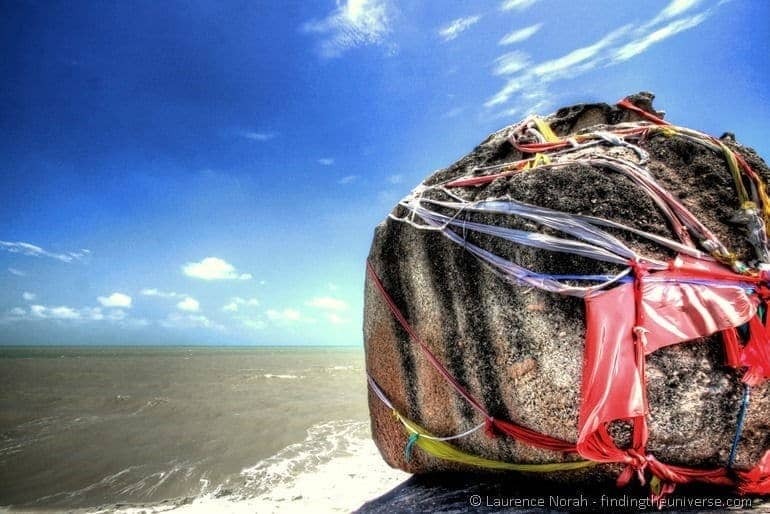 These days the boulder has less on the treasure front and more on the ribbon front, being draped as it is in beautiful cloth and other offerings. It’s a bit of a walk from the town, but you do pass a rather lovely little fishing village on the way, which is nice. We got a bit lost en route, but were saved by a kindly local with a motorbike. Which happened to us quite a lot in Thailand. A beach made from a magic crystal is obviously something to be seen, and the beach that runs down the length of the Songkhla peninsula, from the head of Nag to the giant boulder of Hua Nai Raeng, really is something special. 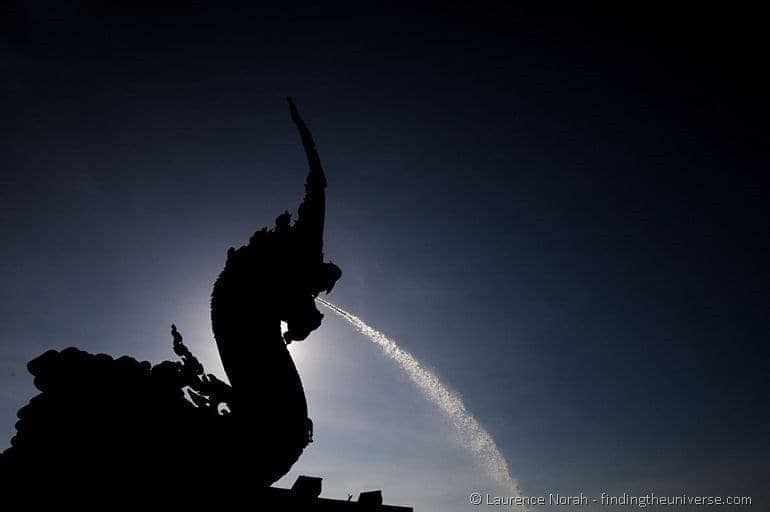 Our favourite part was between Nag and the Mermaid statue, an almost deserted section of powdery white sand backed by an area of forest reserve and of course, that beautiful blue sea. 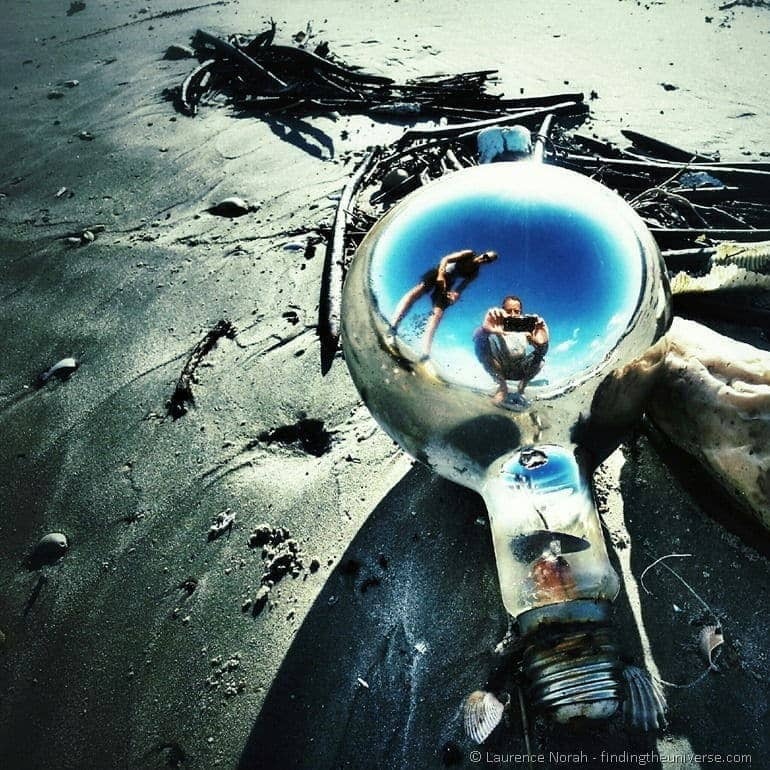 We spent happy hours wandering and discovering bits of flotsam and jetsam, like this photogenic lightbulb, and I see no reason why you couldn’t too. Plus, if you’re in the mood for seafood, there is no shortage of restaurants near the Cat and Mouse statues. This part of the world is just full of history, and though I’m not really a big museum fan, we felt that we really had to get a grip on the history of Songkhla – a town that clearly had a lot of stories to tell. The Songkhla National Museum, which can be found in the former city hall, was built in a Chinese style, and is full of informative displays which are happily also labelled in English. This cost 150 Baht to enter, and was very much worth the entrance fee, both for the building itself, and also for the wealth of information it contained about the, at times contentious, history of Songkhla. You know, I was pretty much sold on Songkhla when I discovered it had a free tram tour. Not that things in Thailand are that expensive anyway, but a tram that you can just hop on for a guided tour of a city is not to be sniffed at. This runs from outside the museum six times a day from 9am, although if not enough people show up, it probably won’t go. This happened to us on our first day, so we just went the next day instead. It’s a great way to orientate yourself to the city, takes around 60 minutes, and did I mention it’s free? Just go do it already. 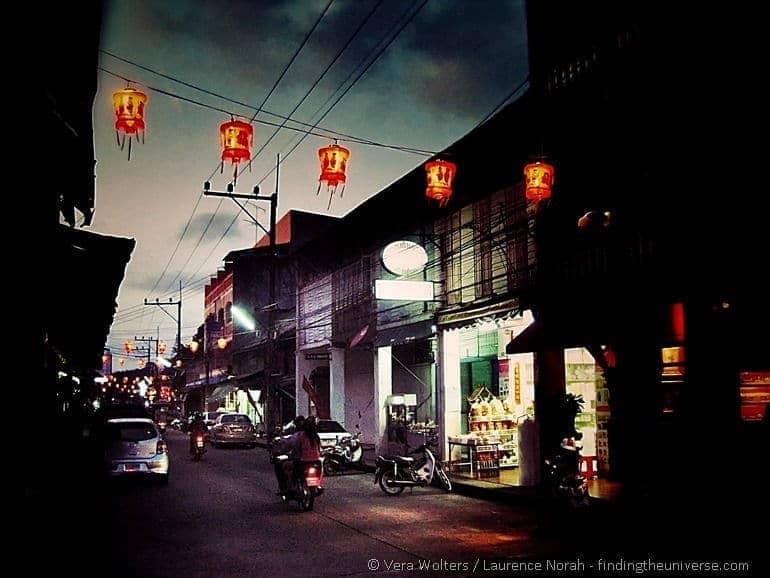 One of the more interesting parts of Songkhla to explore is the old Chinese quarter, which runs down three parallel streets. Here there are Chinese restaurants, a Chinese Opera, and all sorts of the things that you would expect to find in a small Chinatown. The buildings in particular are most impressive, some of them being hundreds of years old, with that crumbly feel to boot. At the end of the Chinese Quarter is the city pillar, which was built in a Chinese style along with the rest of this area. Like most Thai cities, Songkhla has an excellent night market. This runs only at the weekends, and is found by the old city wall which can now be found in the centre of the city (the city limits having expanded somewhat). As well as tasty food (you have to try the giant buns, which are a speciality), there is live music, all kinds of electronic stuff, and inevitably, those people who throw glowing things into the air and make strange bird noises. By far the best place to be fed at the weekend! Songkhla can be reached directly by bus from Bangkok, it takes around fourteen hours. From most of the rest of Thailand you will probably have to head to Hat Yai, the neighbouring (and much larger) city a few kilometres inland, which has an airport and bus links to most of the rest of the country. Songkhla has a large variety of reasonably priced city centre accommodation, with rooms for two available for around 250 Baht. If you want air conditioning, expect to pay 400 Baht and up. Take a look at the wikivoyage site for some good options, as well as further information for more things to see and do should the above list not fill your time adequately! Our time in Songkhla was self funded, but we would like to thank two lovely Thai ladies whom we met up in Chiang Mai who gave us lots of advice for our visit to their hometown. Thanks Oraluck and Wantanee! I know for a fact that no one of our embassy has ever been in these four provinces, simply because they are not allowed to go there because of the advice of their own government……There are issues in this area (less so in Songkhla and Hat Yai) but it primarily affects government officials. Never has anyone rented a vehicle and drove it into crowds. Stick to the beaten path and you should be OK. Government advisories are seldom based on experience and they are certainly not unbiased. Keep up the good work! Thanks for your comment, and sharing your article, which is lovely. It’s nice to see that part of Thailand getting some love – I really enjoyed visiting it, and it was sad that so few tourists made it this far (although sort of nice too!). You might want to update that there have been recent bombings. Unfortunately, nowhere is truly safe in the world, and we have posts that cover a wide variety of destinations around the world, many of which have experienced terrorist attacks, including cities like Paris and London. We believe that everyone should make their own decisions regarding the safety of a destination, based on government advice rather than our opinion, at the time they choose to travel. As no-one was hurt in these bombings, and they don’t seem to be part of a wider campaign, I’m not sure adding this information to the post will be of much assistance to our readers, as it will quickly go out of date. We’re not here to report news or provide safety advice – there are far more qualified and useful sources for that, which we encourage folks to check out before planning any trip. Peoples friendliness. I dont have a driver licens and the Sungathew doesnt go to the zoo. But on the way people driving by asked me, if they could drive me for free to the entrace. How often do you meet friendliness like that in the west? Hello to Lawrence and Jessica, and to everyone. Really happy to have found this site as I was surfing the internet. My name is Victor and I’m Malaysian, based in Alor Setar (about 9 months already) which is about an hour’s drive to the Thai border at Danok. I have driven to Songkhla (from Alor Setar) three times already. Took me about two and a half hours from Alor Setar. Yeah…3 times…and many more trips to come. Why am I so attracted to Songkhla? I was trying to figure that out myself. Then I realised that it was the peace and tranquility that touched my soul. Maybe it’s the effects from the Songkhla Lake and the open sea. And the people are friendly. I will be driving to Songkhla again soon.